Showing 46 articles from May 24, 2017. Crazy week: State titles, playoff win and a coach inducted into HOF! What a week it was in the area sports scene! 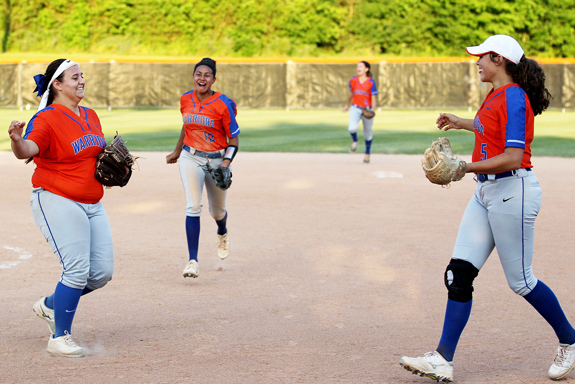 For the first time since 1998, Louisburg High School has moved into the Final Four of the Class 1-A State Softball Playoffs following a 4-0 home victory over Riverside last Thursday. The Lady Warriors will play Whiteville in a best-of-three series this week for the right to advance to the state finals. FRANKLINTON -- The lobby that separates the Franklinton High School cafeteria and auditorium was pulsating with a jazz band and lively student chatter. The only thing that made it different from any other Tuesday was the audience -- Gov. 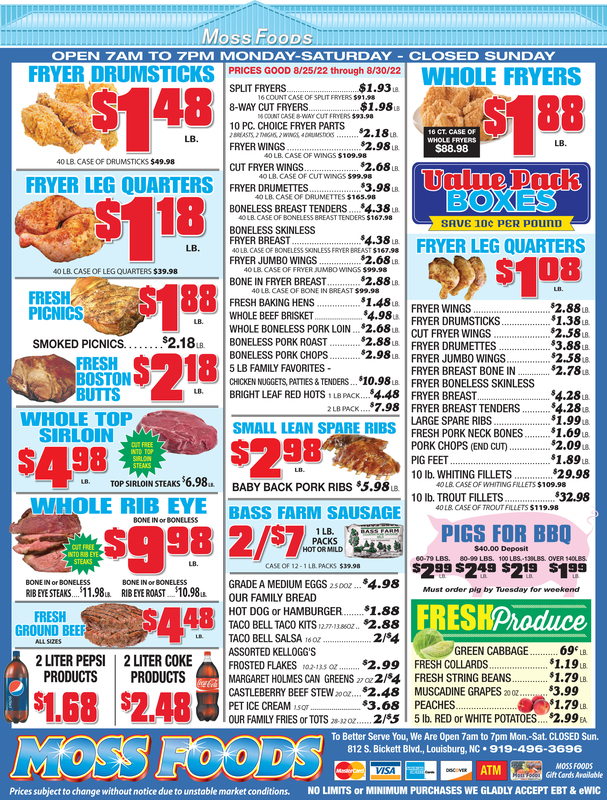 Roy Cooper. 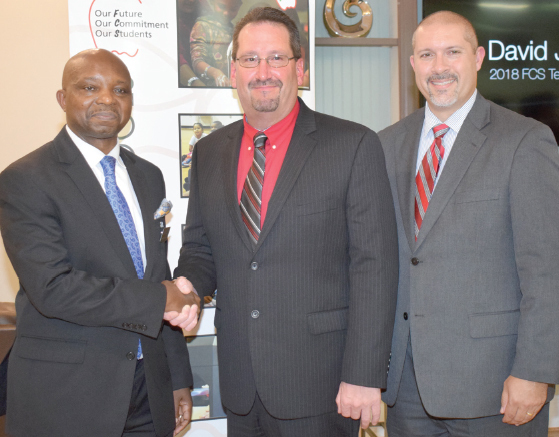 Cooper visited the school to speak with teachers, students and administrators, while touring the county's newest high school -- visiting an English class, an honors forensics science class and getting a close look at the school's culinary arts program. FHS educator is Teacher of Year! EXCELLENCE HONORED. Franklinton High School English teacher David Jennings was named Franklin County Schools' Teacher of the Year at the school district's annual banquet honoring educators. Jennings has taught at Franklinton High School for three years, but his impact goes far beyond his time at FHS, says FHS Principal Russell Holloman. "Dave is the type of teacher that other people rally around. 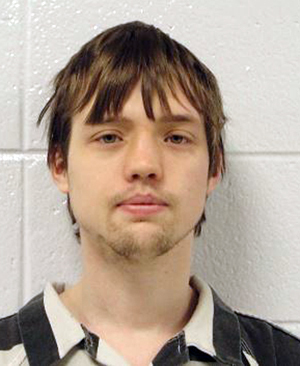 He's the type of teacher you want to have your kid in their class and teach beside them," Holloman said. LOUISBURG -- residents are likely headed for some good news next month. After a preliminary budget meeting last Thursday, the town council seems likely to approve a property tax decrease along with its 2017-18 budget. A formal vote on the budget is expected on June 19, the council's next regular meeting. As presented last week, the budget calls for a two-cent per $100 of valuation tax decrease. That would set the town's property tax rate at .495-cents per $100. LOUISBURG -- The mental health of a teen accused of decapitating his mother will guide how the case proceeds through the court system. Already, it has led prosecutors to notify the courts that they will not seek the death penalty against Oliver Machada. "With the substantial concerns raised about the defendant's mental health at the time of the offense," said District Attorney Mike Waters, whose office made the pronouncement in Franklin County Superior Court on Tuesday, "it was not appropriate for the state to pursue capital punishment." Why does government spring leaks? 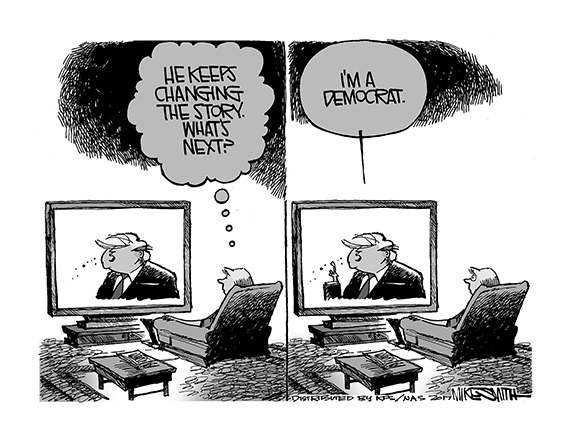 Maybe it's time to share a dirty little secret that I've discovered from four decades of covering government at a variety of levels -- and hope that it will help put some of what you're hearing out of Washington, D.C., lately in perspective. You're hearing complaints from those in power about "leaks" to the press which, they contend, are illegal, un-American or downright wrong and must be stopped at all costs. We trust that all careful readers of news stories found something to chuckle about last week. In fact, there may have been a few disbelieving guffaws heard around the county, although those we can't confirm. The line that certainly drew chuckles from those in the know was about the county's proposed budget being "unprecedented." There are a lot of things you can do with a cop. You can run from a cop. That can be a hair-raising experience. I'd highly recommend that you do not make a habit of this activity. You can ride along with a cop. It's an eye-opening experience. Most people do not have an endless supply of money. 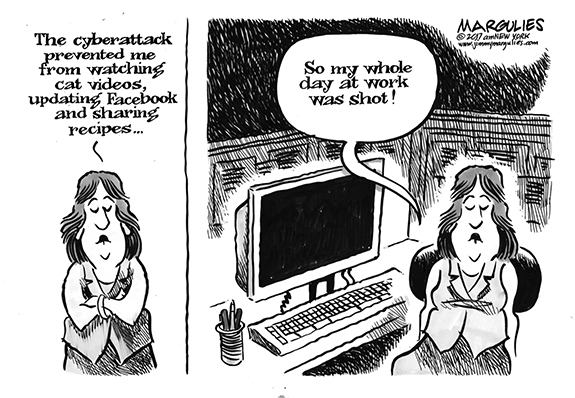 They cannot just print more when they want it, or force others to give it to them. I say most people because there are those that do print their own money, and force others to give them what they have earned. 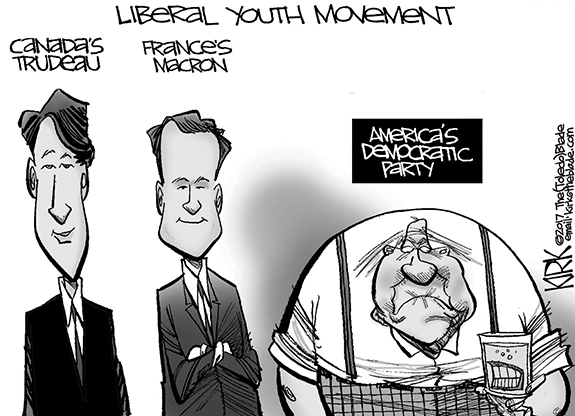 On one side of things it is called organized crime; on another it is called the government. It is budget time again in Franklin County. Everything costs something, and someone has to pay for it. LOUISBURG--Memorial services for Harold Davis, 59, who died Saturday, May 20, 2017, will be held Wednesday, May 24, at 12 noon at the Richardson Funeral Home Chapel in Louisburg, NC. FRANKLINTON-Funeral services for Mildred K. Eaton 94, who died Friday, May 19, 2017, were held Wednesday, May 24, at 2 p.m. at the Old Liberty Baptist Church in Youngsville. Burial followed in the Old Liberty Baptist Church cemetery. RICHFIELD, NJ - Funeral services for Shannon Richardson, 54, who died Saturday, May, 20, 2017, will be held Wednesday, May 31, at 2 p.m. at Pine Chapel Baptist Church in Hollister, with the Rev. Robert Hedgepeth officiating. Burial will follow in the Pine Chapel Memorial Garden Cemetery. SAUNDERS SLIDES IN. Louisburg High School's Kaylee Saunders slides head-first into third base during last Thursday evening's home softball playoff victory against Williamston Riverside at Warrior Field. 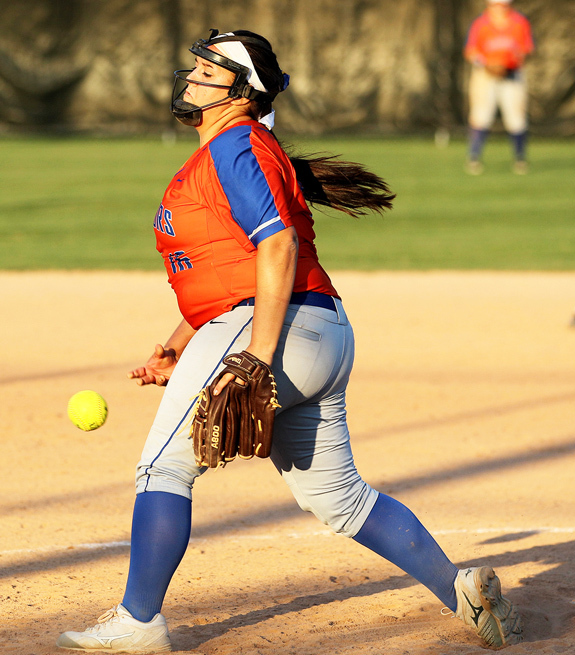 LOUISBURG -- Before the postseason began, members of the Louisburg High School softball coaching staff thought their club's depth at the pitching position would be one of the Lady Warriors' greatest strengths down the stretch. 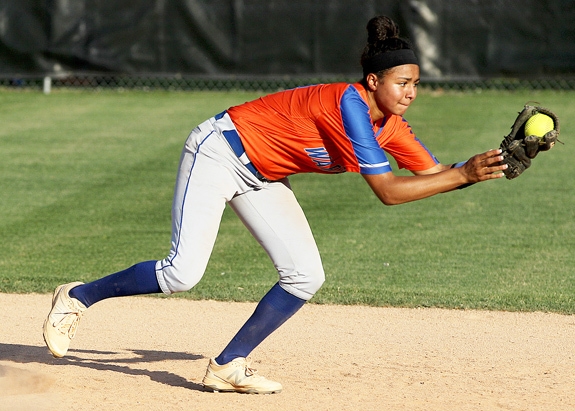 That assessment has proven to be correct as co-aces Laine Barefoot and Arianna Fuller-Bell have taken turns carving up opponents. LOUISBURG -- The best is yet to come. That's exactly how Louisburg High School boys basketball coach Michael Sheldon views the potential of LHS senior standout Octavius Scoggins. 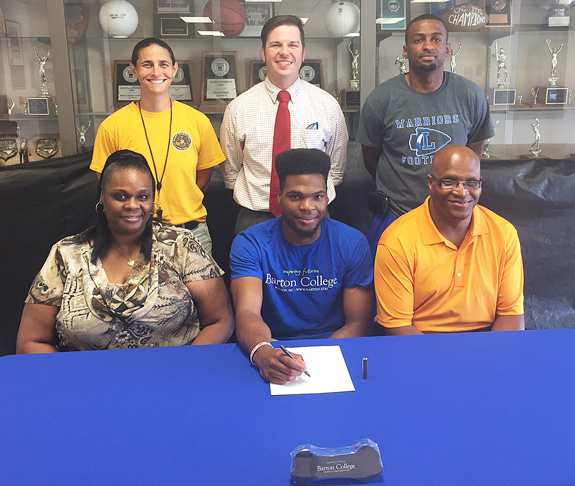 Scoggins, a 6-foot-3 forward, has been banged up with injuries over the past few years -- but that didn't keep Barton College from offering Scoggins the opportunity to join the school's tradition-rich men's basketball program as a preferred walk-on. LOUISBURG -- Louisburg High School has reached the Final Four of the Class 1-A State Softball Playoffs for the first time in 19 years. 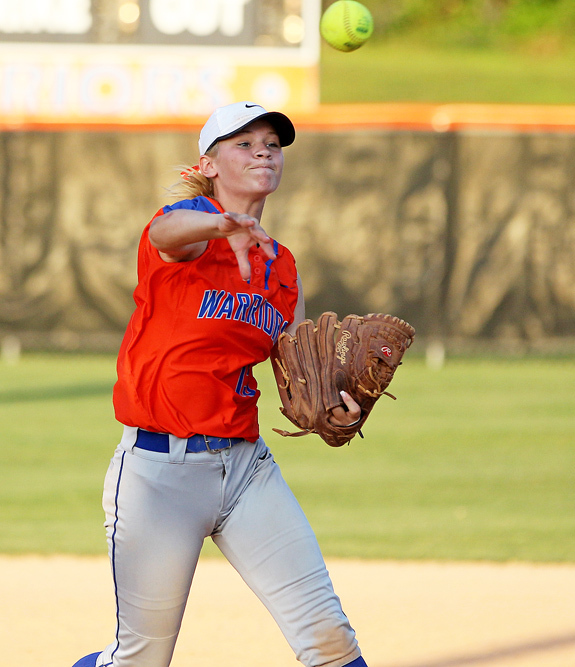 But when the Lady Warriors were going to play next was uncertain as of late Tuesday afternoon. Louisburg was supposed to open its best-of-three East Regional championship series against Whiteville on Tuesday with a single game at home. But heavy rains washed away any chance of that contest being played. HENDERSON -- Kerr-Vance Academy enjoyed one of the most momentous days in the history of school's athletics program last Saturday -- and several Franklin County residents played huge roles in the Spartans' success. 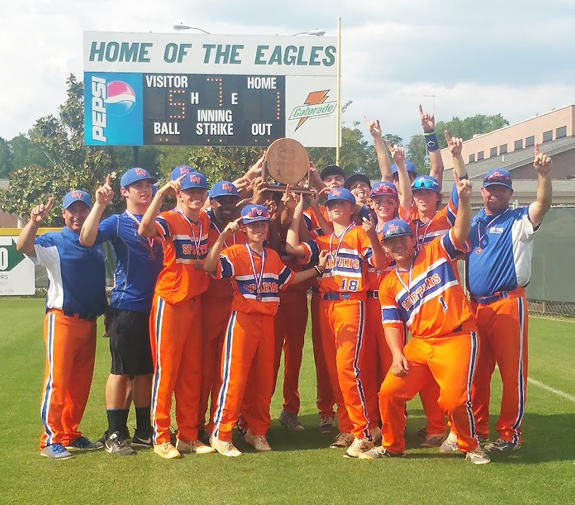 Kerr-Vance Academy's baseball squad, with county resident Mike Rigsbee serving as an assistant coach, claimed the North Carolina Independent Schools Athletic Association's Class 1-A State Championship by defeating Lawrence Academy two games to one at the neutral site of the Oakwood School Baseball Field in Greenville. GREENSBORO -- Results weren't necessarily the most important thing Franklinton High School coach Clennie Wilkins was looking at during last Friday's action at the Class 2-A State Track and Field Championships. Instead, Wilkins was more interested in watching how his younger performers would respond to the challenge of the state's biggest stage at the Irwin Belk Track at Aggie Stadium on the campus of North Carolina A&T State University. 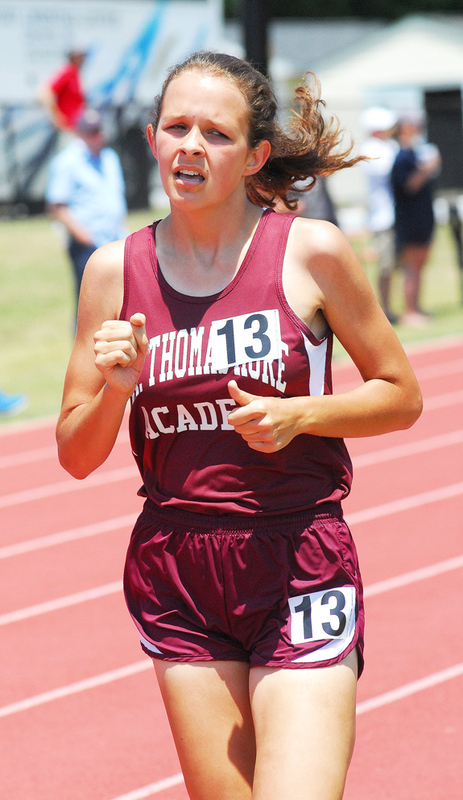 BUIES CREEK -- St. Thomas More Academy in Raleigh has gained a well-deserved reputation in recent years for its penchant for producing quality distance runners. Two of those performers are from Franklin County -- and are sisters. 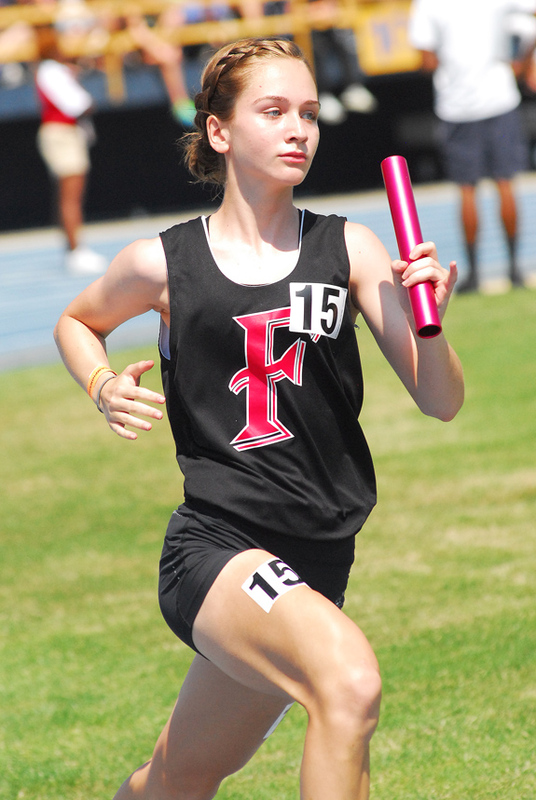 Lucy Ketterer, a sophomore, and Sally Ketterer, a freshman, were among the numerous St. Thomas More participants at the annual North Carolina Independent Schools Athletic Association Class 1/2-A State Track and Field Championships. Louisburg's Phil Mueller is flanked by college coaching legends (l to r) John Welborn and Reggie Wicks after receiving his plaque and green jacket. LOUISBURG -- Having a green jacket slipped over your shoulders isn't an honor limited to Masters Sunday at Augusta National Golf Club. 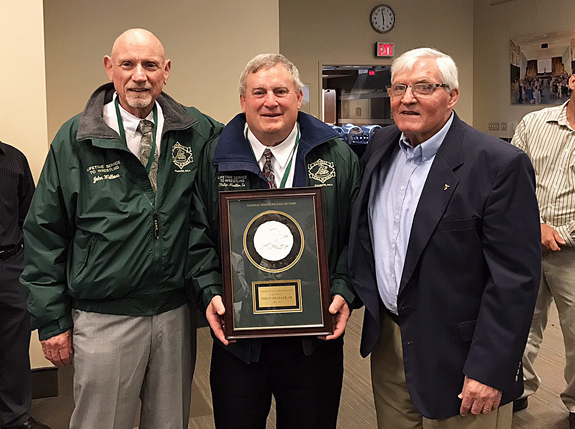 After a lifetime of service to the sport in a variety of roles, Louisburg's Phil Mueller was presented with a green jacket and a plaque on Sunday -- synonymous with his induction into the North Carolina Chapter of the National Wrestling Hall of Fame. Mueller was one of six inductees during a ceremony in front of a packed house at the Friday Center on the campus of the University of North Carolina-Chapel Hill. 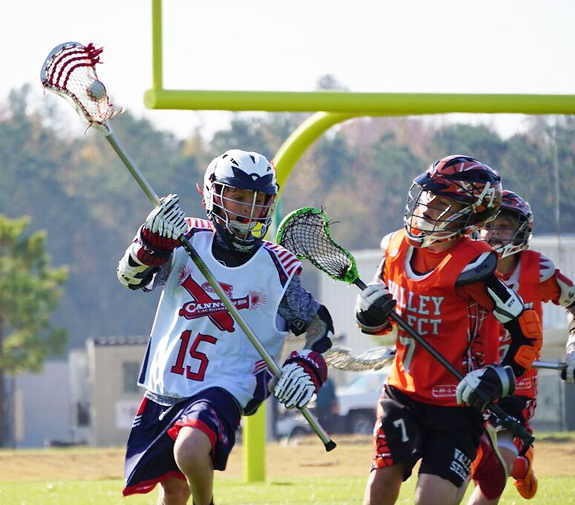 HENDERSON -- Beau Burnette, son of Scott and Caroline Burnette of Henderson, a current 6th grader at Kerr-Vance Academy has been named as a 2017 National Lacrosse All-Star and has been selected to represent the State of North Carolina at the National Lacrosse Academy and National Lacrosse Classic to be held July 18-21, 2017 in Richmond, Virginia, at the River City Sportsplex. WINSTON-SALEM -- Corbin Burnes struck out a career-high 10 batters over seven scoreless, Eric Hanhold worked through two scoreless in relief, Nate Griep earned the save and both Trent Clark and Max McDowell had RBI triples in the tenth as the Carolina Mudcats defeated the Dash 3-0 at BB&T Ballpark on Sunday afternoon in a Class A Carolina League baseball showdown. The game was scoreless through the ninth before the Mudcats (23-20) rallied for three runs and four hits in the tenth and final inning. Louisburg High School third baseman Taylor Ferguson makes a strong throw to retire a batter during last Thursday's playoff decision against Williamston Riverside. 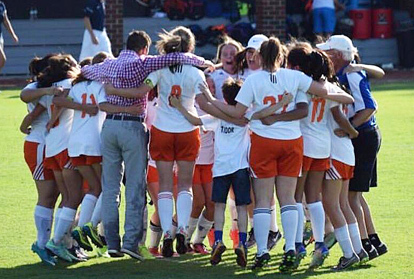 Members of the Kerr-Vance Academy girls soccer squad celebrate after finishing off the championship with a 1-0 victory over Halifax Academy in the finals of the NCISAA Class 1-A State Soccer Tournament. The event was staged at Campbell University. 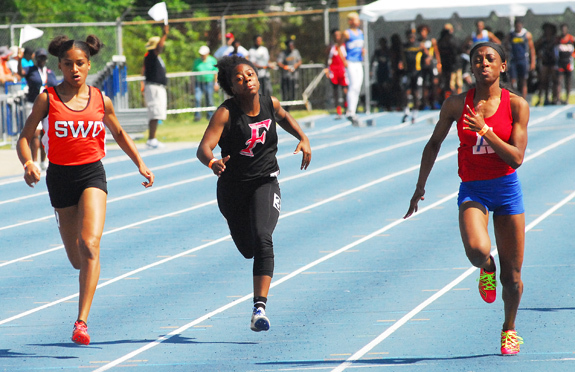 Franklinton High School's Shea Seward (center) sprints toward the finish line in the Girls 100 at last Saturday's Class 2-A State Track and Field Championships in Greensboro. ANOTHER VICTORY FOR THE HEAT. 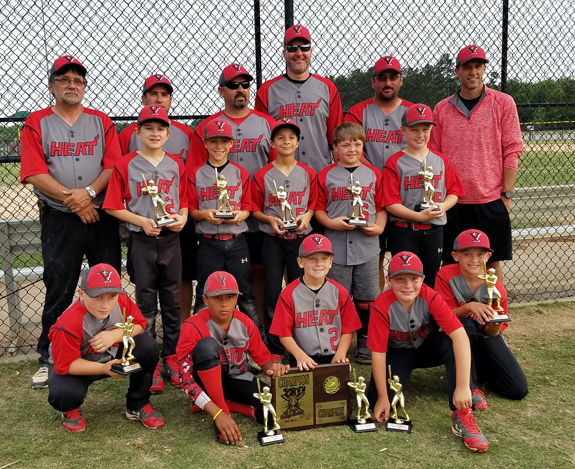 The Youngsville Heat recently won the championship of the silver bracket at the 2017 Top Gun Battle For The Bats in Rocky Mount. 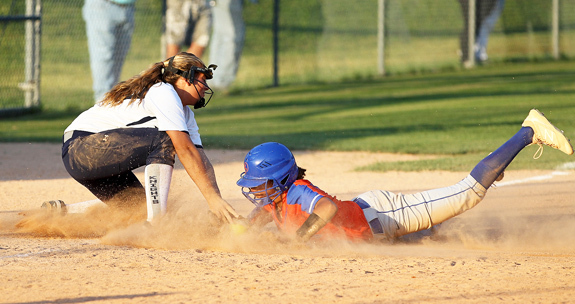 The Heat defeated the Rocky Mount Raiders 16-1 and the Carolina Titans 9-7. Kaylee Saunders was sharp in the field and at the plate during last Thursday's home playoff victory against Williamston Riverside High School. 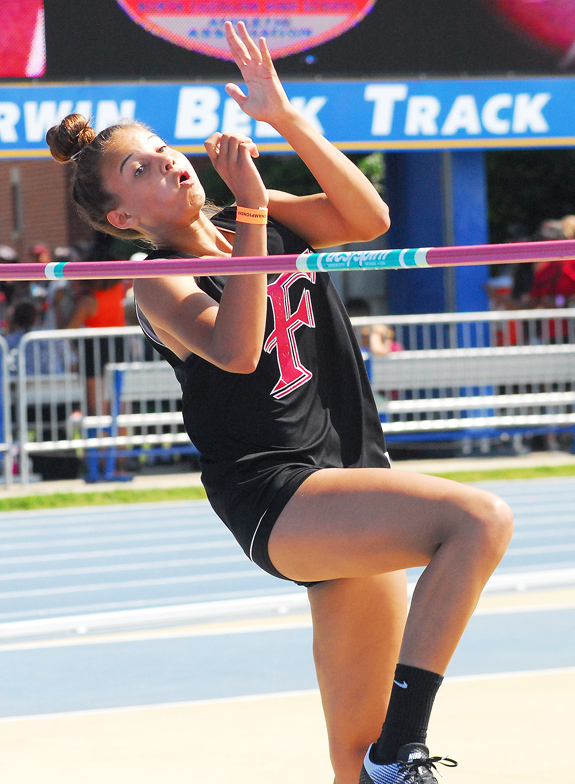 Franklinton's Rebekah Smith qualified for the girls high jump this season at the Class 3-A State Track and Field Championships as a freshman. Louisburg High School softball players (l to r) Arianna Fuller-Bell, Kaylee Saunders, Mackenzie Wood and Laine Barefoot celebrate following last Thursday's home playoff win. Franklinton Christian College, one of several educational institutions for African Americans in Franklinton during the late nineteenth and early twentieth centuries, uplifted the students who attended it. The school and its antecedents operated from the 1870s until it closed in 1930 -- a victim of the Great Depression. HENDERSON -- Brady, a company that provides energy-efficient HVAC systems and comprehensive building solutions for commercial and industrial facilities across North Carolina, recently awarded the annual Mike Bradley Memorial Scholarships to Vance-Granville Community College students Michael Hall of Creedmoor and Cedric Rodebaugh of Franklinton. Both students, who are studying Welding Technology at VGCC, received a $500 scholarship to help fund their education. 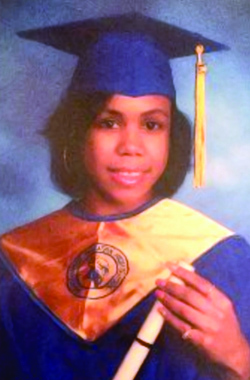 ROANOKE RAPIDS -- Jiona Mills, a Northwest Halifax High School graduating senior. has been awarded the 2017 Alston-Pleasants Scholarship for undergraduate studies at the University of North Carolina at Chapel Hill. Mills is president and valedictorian of her graduating class and, while excelling at academics, she is also active in sports, including serving as Captain of the track team. She is also an alumna of the North Carolina Governor's School. 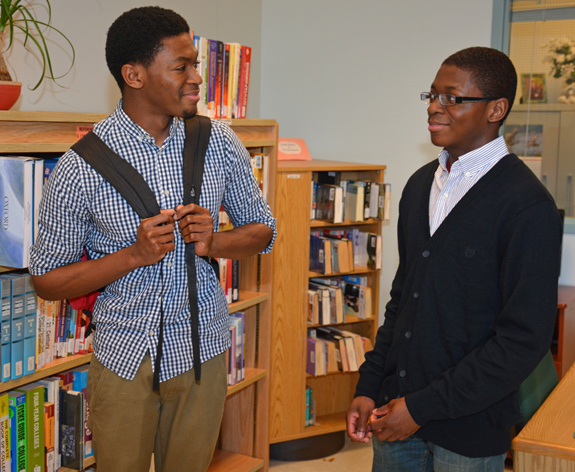 Twin brothers Paul Caroline and Peter Caroline of Louisburg began their higher education at Vance-Granville Community College and will soon continue that education at two of the nation's top universities. Both received full QuestBridge scholarships, Paul to the University of Pennsylvania and Peter to Stanford University. According to U.S. News & World Report, Stanford is the country's most selective university, accepting only five percent of applicants, while Penn has the 14th lowest acceptance rate. First 'Third Friday' featured fun and festivities! TAR RIVER THUNDER. 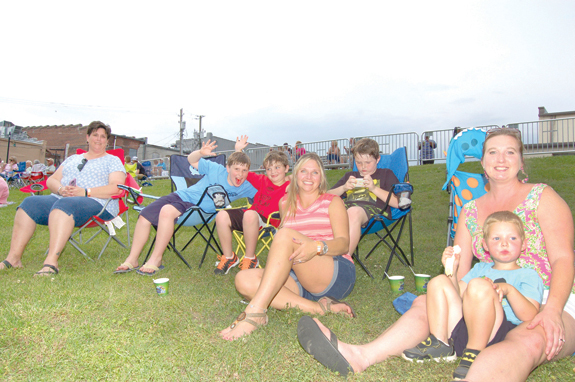 Above, Amy Cheshire, Sutter Cheshire, Jack Davis, Brandi Davis, Zack Smith, Jamie Smith and Ian Smith relax on the lawn; Below, Jackie Barrett, center, and members of The Nut-N-Tuits Line Dancers enjoy music from the Castaways during the first Friday Nights on the Tar, which saw a storm sweep through, but didn't dampen the fun. LOUISBURG -- A former Franklinton police officer asserted his innocence in court on Monday. A grand jury indicted Jason Tate in October, signifying there was enough evidence to warrant bringing sexual assault charges against him. Agents with the State Bureau of Investigation allege Tate assaulted an 18-year-old girl during the early morning hours of Aug. 7. LOUISBURG -- The case against a Youngsville woman accused of killing a 7-year-old in a car accident was continued until July. GOLD MEDAL MAXIMUM EFFORT. 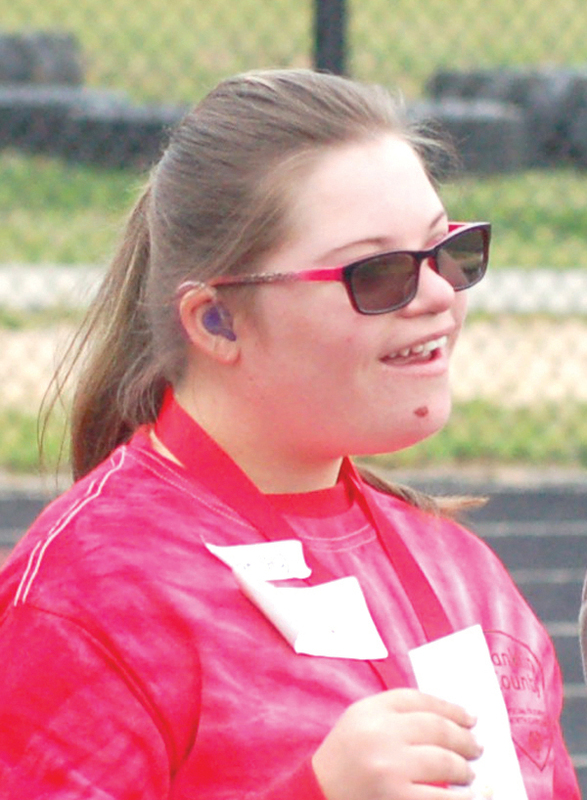 Franklinton High School was the site of the annual Franklin County Special Olympics earlier this month, hosting dozens of kids from in and around Franklin County who showcased their skills in track and field events. 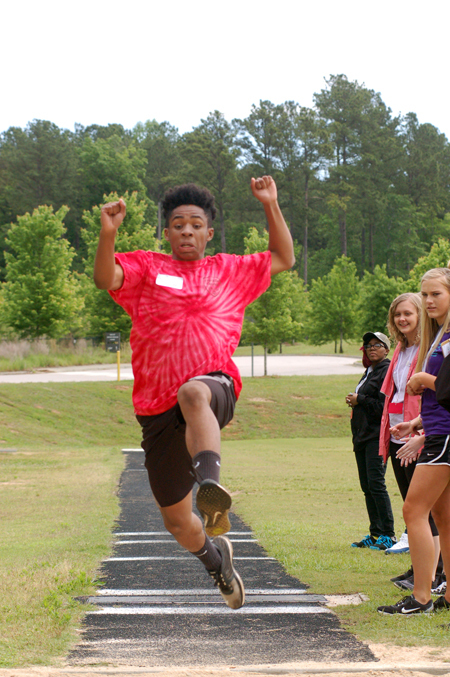 Above, Shemar Kearney gets off a terrific leap during the long jump competition. The event was held on May 9 after rain forced a delay the previous week. 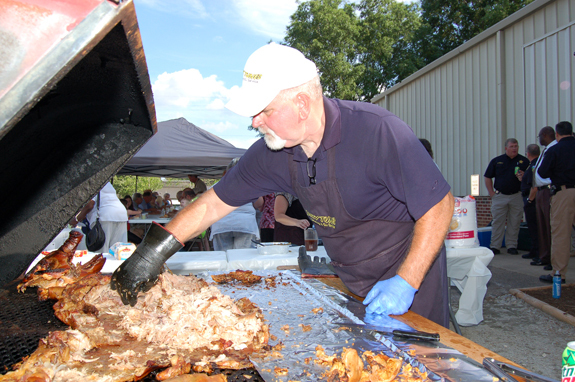 Bennie Gupton manned the grill, providing a whole hog for those who came out to the event. LOUISBURG -- Investigations into two separate child sexual exploitation cases resulted in arrests this week. Deputies arrested Joseph Algernon Morris, 25, on May 22 and Stanley Calvin Pigue on May 23, charging them both with various counts of felony third degree sexual exploitation of a minor. Warrants and arrests in both cases stem from investigations conducted by the sheriff's office's Internet Crimes Against Children Task Force. LOUISBURG -- Franklin County sheriff's deputies and town police arrested a Raleigh man on domestic assault charges. Authorities allege Damien John Adkins kicked in the door at his ex-girlfriend's house, assaulted and choked her on May 18. A patrol deputy spotted Adkins on nearby Wes Sandling Road and officers from both agencies searched the woods to locate him. FRANKLINTON -- Sheriff's deputies are investigating a shooting that sent a 28-year-old Raleigh man to the hospital. According to authorities, deputies were alerted to a shooting on Lane Store Road at about 1:30 a.m. on May 21. LOUISBURG -- A man who pled guilty to stealing from a Louisburg Elementary School fund will avoid jail time. Franklin County sheriff's deputies arrested Markee Burnette in October, alleging he stole money from a cookie dough fundraiser. Surveillance footage revealed a man, later identified as Burnette, taking money that was placed inside envelopes that were set aside for the fundraiser. LOUISBURG -- Three people who investigators allege lured a Henderson man to a home and killed him pled guilty to their roles in the Vance County crime this week. Charges remain pending against three other suspects, including the woman authorities allege shot and killed Marcus Fields in December of 2015.